Worship with us at FCC! We gather for worship at 10:00 AM during the school year and at 9:30 AM in summer (June thru Labor Day). Learn more about what to expect in worship below and check out our Calendar of Events for upcoming special worship services, events, and activities. During the school year, we gather for worship at 10:00 AM in the sanctuary at 310 Bluff Avenue in Sheboygan. Worship is usually led by our pastors, Jim and Julia Hollister, often with the involvement of lay members who read scripture, opening prayers, etc. Free nursery care is provided during the service. 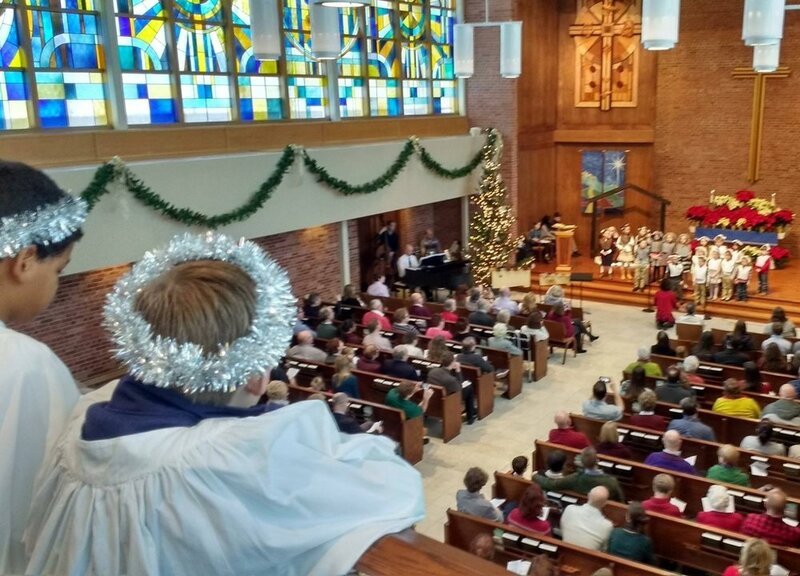 Children attend the first portion of the service with their families and then leave for their Sunday School classes, usually after a “Time for Children.” Classes conclude at 11:15 AM, and we invite visitors to join us in Lucas Hall for a coffee hour at that time. We share in the Lord’s Supper (sacrament of communion) on the 1st Sunday of the month. All are welcome to participate in this ritual meal. This meal is open to all Christians — men and women, youth and children — who wish to know the presence of Christ and to share in the community of God’s people. A hearing loop (turn hearing aids to “T” setting) and large print versions of the Sunday bulletin are available to worship-goers. Whoever you are, wherever you are on life’s journey, you are welcome here. We are a spiritually diverse congregation located in Sheboygan, WI where God is still speaking. FCC Sheboygan is designated as an Open and Affirming (ONA) church. ONA is the United Church of Christ's (UCC) designation for congregations, campus ministries, and other bodies in the UCC which make a public covenant of welcome into their full life and ministry to persons of all sexual orientations, gender identities, and gender expressions. We affirm all who seek to follow Jesus’ way and share their gifts in service to the church and wider world, regardless of race, physical or mental capabilities, socio-economic status, marital status, sexual orientation, gender identity, and gender expression. We also believe that all the Christians are called to be “ministers.” Each one of us has a primary “arena” of ministry; for some it might be in the church (as for us pastors); for others, that primary arena of ministry will be the home, the workplace, or the wider community. Learn more about our ministries.